Don't get me wrong, I loved Dapol. I literally jumped for joy when they were first advertised on the back of DWM back in 1988. For me, accuracy was less important than having a representation of the character. But they did have to be able to move. So in 2001, when Dapol decided to make unarticulated statues instead of action figures, it was time for me to make my own. I'd experimented with customs for a few years, making my own 8th Doctor Dapol figure for one. But this was a massive undertaking. To cast whole bodies from scratch that I could make into whoever I wanted. 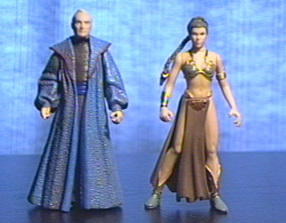 In order to make my scratch figures, or 'clones' as I called them, I selected two Star Wars figures with generic parts that could be cast the modified to become any desired individual. For the men I chose Chancellor Valorum (he has great generic legs under that robe) I also initially used the bare arms from the original Dagobah Luke but then changed to the arms of Han Solo (Endor) as most of the people I was making would have sleeves and not muscly arms. For the women, I used Princess Leia (Slave outfit). When planning a character, I used the template below to draw on the various modifications I needed to make. Pretty soon, I'd made every Doctor, enough companions to see them through time and space and a pantheon of monsters and villains for them to fight. every Doctor and some of their most iconic companions and enemies. Over the years I've seen the unbelievable custom work of so many wonderfully talented people with results far beyond what my efforts could ever achieve. 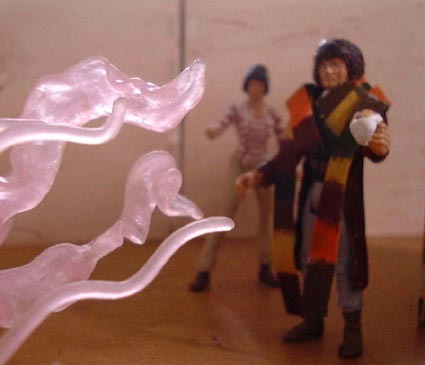 But at the time, like Dapol, my figures were for me, acceptable representations. 2001. A promo I made to celebrate the move from Dapol figures to my own. Suddenly every Doctor could have their own adventures! Here for the first time are pictures of all the custom figures I made. Some have never been seen before.